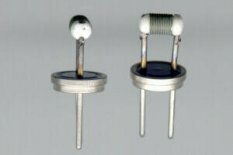 These IR sources are 8 to 11 W wire wound parts suitable for use as steady state sources. This infrared light source is a thermal emitter with an emissivity of ~80%. It is appropriate for use in laboratory or field instrumentation due to its long life and stable properties. The coiled filament operates at 900°C when powered with 10 watts for the standard IR-12 and IR-12R sources or 975°C when powered with 11 watts for the IR-12K. The radiating element is a coiled resistance wire which has a high emissivity in the infrared spectral region. The coil is supported on a cylindrical substrate of alumina, resulting in the windings being electrically insulated from each other. This contributes to a more uniform radiating source. The unit does not require operation in a sealed atmosphere. The header which is fabricated from cold-rolled steel has a diameter of 8.6 mm. The support pins, which are also the power leads, are hermetically sealed in glass. IR12K + MC233 The IR-12 part uses a high stability wire where as the IR-12K uses Kanthal resistance wire for operation at higher temperatures. Apart from the wire used, the IR-12 and IR-12K are identical. The IR-12R is a standard IR-12 fabricated with the header flange in the reverse direction. These popular units have been in production since 1980. They are considered rugged and reliable.